The incident of that time when the Japanese bombing aircraft were bombarded all over the Barma. The heroine of this story, 'Meye Byomkesher' grew up at that time. All girls are just Byomkesh. From the birth they are lizard (detective). Not only does the tick tick the words, she looks at someone whom she will consume, the poor man can not escape from her, if he disappears or goes to another country, even then there is no salvation for him. The heroin will find out to her hero exactly. There is no relief from her hand. The heroine of this story is similar with the great detective Byomkesh, readers will judge it. Let's read this romantic story from pdf file. 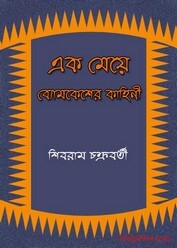 The book has written by the prominent author Shibram Chakraborty.